From the muddy banks of the Dee....: eat, sleep, Patch, repeat. Most of the time the Patch is fairly predictable. High then low tide. Birds roosting then feeding. It is reassuring in its certainty. On the whole I know what is likely to happen and what I have a chance of seeing when I set out on another Patch manoeuvre. But then there are those moments. The little events and happenings that keep you returning for days when nothing much happens because there is always that slim chance that you will have another of those moments. For some Patch watchers it is something rare turning up, an addition to a life list or a Patch list. For me it is those moments that seem too crazy to be happening, the "Am I really seeing this?" moments. Hilbre stands at the head of the Patch, the furthest point you can go finishing at Liverpool Bay and the wider Irish Sea. Today it is the same as usual for this time of year. Redshanks and Turnstones scurry over the low seaweed covered rocks in front of Middle Eye, the newly arrived Brent Geese are grazing the weed on the west side and the Oystercatchers long running and noisy disputes are continuing as normal. While things may be run-of-the-mill on the Patch today I am seeing it a little differently, well, hardly seeing it at all really. It is dark. Now I wouldn’t normally recommend a trip to a tidal island on one of the fastest tidal estuaries in northern Europe at night but I saw the forecast for clear skies and thought it’d be a good evening for a spot of night sky photography on the Patch. It seemed like a good idea. Reality was a little different. As I gazed upon the screen of my phone showing a wildly inaccurate and overly optimistic weather situation I knew it was going to be a bust as far as star photography was concerned. There was some clear sky, trouble was it was several miles away over the big city lights of Liverpool. Above us only clouds. My companions were putting on a couple of brave faces and making the most of the uniqueness of a trip to Hilbre in the dark. Testing set ups, exposures, making mental compositions for when we could return under a clearer firmament. The birds were still active. The Oystercatchers continued to “pip-pip” in disagreement, a Curlew called but didn’t receive a reply. Redshank piped lonely whistles every now and again. I think I heard Grey Plover too. After a couple of cups of coffee and a bun each we decided to cut our losses and head back to the mainland. As we were preparing to go the clouds started to part. 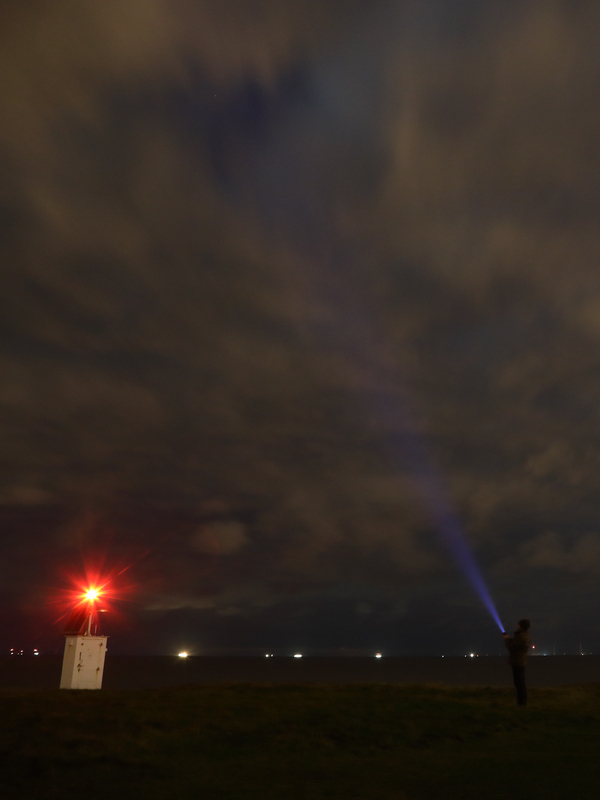 Perhaps we were going to get one small window to shoot some stars. The Patch always delivers. We jumped in the 4x4 and headed over to Middle Eye to get a shot looking back on the island with the starry sky above. Clouds rolled in. Thwarted and further delayed from a return to the sanctuary and warmth of home. We re-embark the vehicle and I flick on the headlights illuminating the path home. The lights aren’t fantastic and I think I may have to make good on my boast that I could find my way off the island with my eyes shut. It’ll be an adventure, I think to myself. We bump over the rocks past Middle and emerge on to the smoother sands that lead to Little Eye. There are a few scattered rocks that poke out from the blanket of sand and I zig-zag the truck through these. After a hundred yards or so of manoeuvring something unusual catches my eye on one of the rocks. It looks a little different, beige and speckled rather than seaweed covered reddish-brown sandstone. Our path through the rocks takes us straight in its direction, our headlights illuminating it. As we inch closer the beige blob becomes discernible. That’s when I know the Patch has done it again. 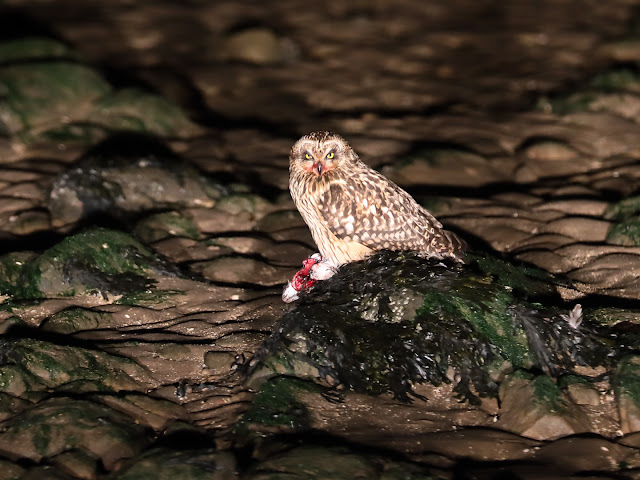 There on the rock, tearing at the bloody carcass of a careless (or unlucky) Redshank sits a Short-eared Owl. 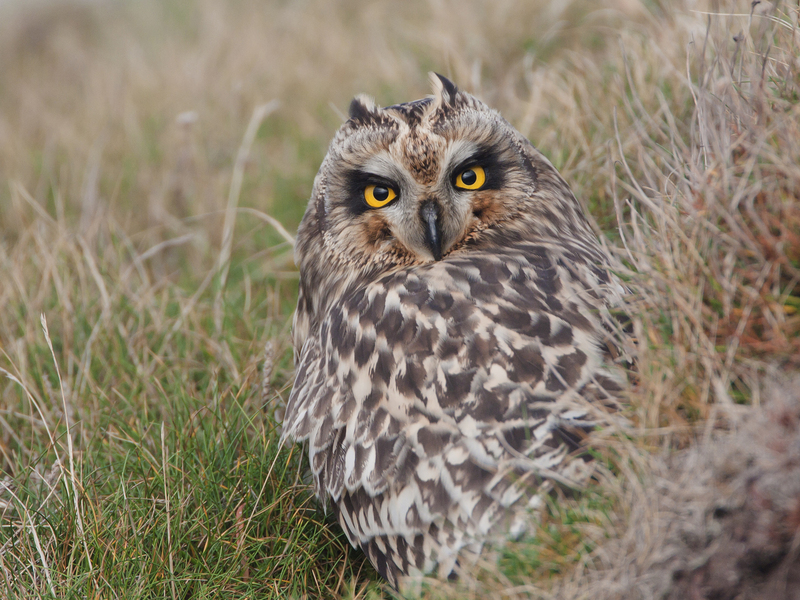 A while ago I encountered a Shortie on the island. It was soon after dawn and I was the first to arrive on the island. It had roosted on the footpath along the west side of the island and as I walked along hoping to find a Wheatear it looked up and fixed me with what could only be described as a “hard stare”. At the time I remember thinking this is why I dragged myself out of bed and walked across the muddy shore as dawn broke, for one off moments like this. I thought “This will probably never happen again, so make the most of it, get the settings right and get the picture”. But it has happened again and this time in even more unlikely circumstances. Who could have predicted this? In shock I call out what I have seen so the others can see too, I think there was some swearing involved, but I think I can be forgiven the foul language due to the unique and unexpected events that are unfolding in the beam of our headlights. The Shortie seems unfazed by a car appearing at its dinner table. It also seems unwilling to give up its prey. I can’t blame it, catching a nifty Redshank in daylight must be tricky enough, let alone after nightfall. It stays in the glare of the lights while we collectively fumble to reassemble kit that had been stowed away in mild disappointment and try for a picture we never thought we would ever get. High ISO, wide open lenses, slow shutter speeds, the odds of a great shot are slim, but the Owl obliges by staying still and we have several goes at getting it right. I get all carried away and start saying sweeping statements like “once in a lifetime”, or “never as long as you live”. The tinge of disappointment at missing out on the stars is swept away on a tide of owl-in-the-dark photography. 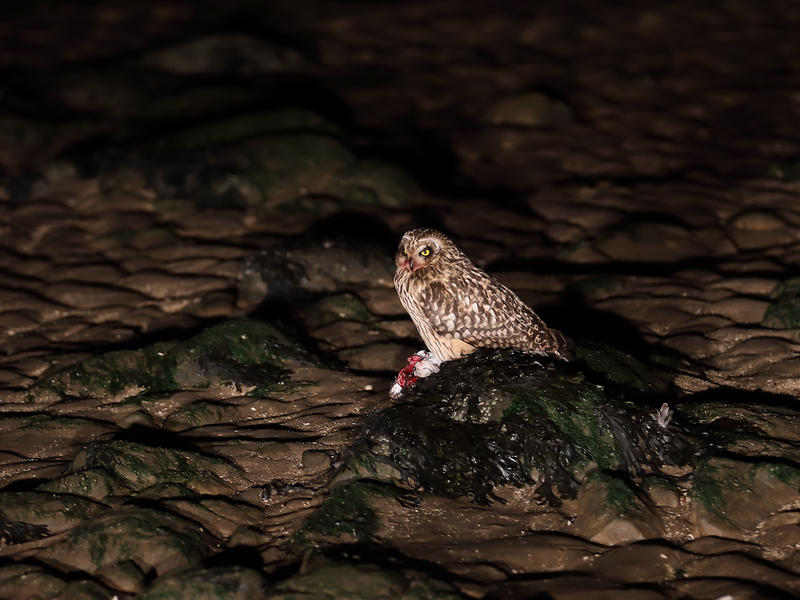 After we have our pictures I carefully reverse away and take a longer drive around the rocks so that we don’t disturb the owl’s meal (the following day I return and find our tell-tale tracks in the sand and look at the rocks where we encountered the Shortie. There are plenty of droppings and no sign of any Redshank remains so I figure it lingered there long after we had left). As we round Little Eye and I point the vehicle at the lights of West Kirby I say to my companions that we could repeat the trip a hundred times or more and we’d never see that again. Later on it occurs to me that yes, while we would not see a Shortie on prey in our headlights we would see something else, another golden Patch moment. … eat, sleep, Patch, repeat.